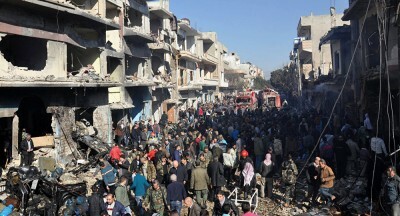 Over 22 people were killed in a massive blast in the Syrian city of Homs near a hospital, according to a source. At least 22 people were killed and over 70 injured in the explosion near a charity association and the al-Ahli hospital in the center of the Syrian city of Homs, a source in the hospital said Saturday. “According to our information, 22 people have died. There are about 70 injured people in the hospital. Some of the wounded were also taken to other hospitals,” an employee at the al-Ahli hospital told RIA Novosti. Most of the injured are in critical condition, according to the source. We are providing emergency assistance, however there are seriously injured people here and more are still comming in. A lot of wounded started arriving after the second explosion. Warning: The following video contains graphic content that some may find disturbing. Viewer discretion is advised. According to local television, the area was rocked with two large “terrorist explosions” with the first blasting in the vicinity of the hospital while the other reportedly hitting a close-by shop within minutes. The car was packed with 150 kg of explosives, the Syrian Arab News Agency (SANA) stated. “A terrorist car bomb attack took place in central Homs city on Saturday, leaving a number of civilians dead,” the agency reported. This was the largest terrorist attack in Homs in the five years of the Syrian crisis. A group of terrorists detonated a car bomb near a hospital in the center of the Syrian Homs. The blast that took place near gas cylinders triggered a second explosion. As a result of the two explosions several houses and shops were partially destroyed. Syria’s Prime Minister Wael Nader Al-Halqi condemned the explosions, stressing that these terrorist attacks will not hamper the truce and the fight against terrorism in the country, according to SANA. رئيس مجلس الوزراء الدكتور وائل الحلقي يؤكدأن هذه التفجيرات الإرهابية لن تثني عزيمة الشعب السوري على إنجاح المصالحات الوطنية ومحاربة الإرهاب. “Prime Minister Wael Nader Al-Halqi confirmed these were terrorist bombings, however, these attacks will not affect the national truce in Syria and will not hamper the fight against terrorism,” the tweet states.